Reviews of purchases relating to football. First of all I have no idea why the writer of this book wants to remain secret! What is so secret about all that? That information is readily available on internet and in books. The general consensus is that these books (yes there are more!) were written by David Bentley. Some say Dave Kitson. Frankly it doesn’t matter because the only chapter worth reading is number 4. That does give you some insight into the money involved in football and to be fair is a bit of an eye opener. If you are going to write about your experiences in football then write an autobiography but then how many of those would sell if this person revealed their true identity so I suppose this is a better way to make money from sales! I bought this book at the airport before going on holiday but really should have bought some sun cream. Then again I don’t really need sun cream but then again I don’t really need this book. The book consists of 287 pages with the last 6 pages left blank for notes. There are 7 Chapters and a Conclusion in the book. 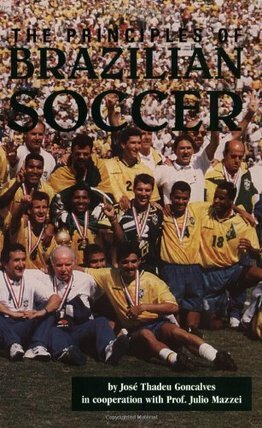 The author Thadeu Goncalves did play professional football in Brazil for five years and holds a Brazilian National Coaching Licence so he does possess an inner understanding of the game and culture in Brazil. The book starts with the different philosophies of the game, separating the South American from the European game. In this respect it is outdated but the book was written 16years ago so is understandable. It talks about how the English, Dutch and Germans move the ball but again this is a matter of interpretation because over the years a lot has changed in terms of how teams set up. The planning section is very good as it deals with not just planning for the team and individual players but for a club as a whole and also deals with the culture of parents being coaches and the need for education. There are a number of drills in the book and also phases of play such as building from the back and movement of players. It is a very technical book and more suited to the adult game in some parts but can equally be applied to youth football when looking at the technical parts of the game and development of players. The diagrams are in black and white and are very precise and easy to understand. This is a book that I highly recommend if you are a coach and one you will use as a regular reference point. This book contains 25 chapters with a career record at the back. The book is 390 pages long excluding the index. 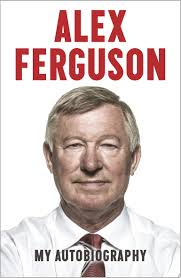 I think the title is a bit misleading because it does not really cover the whole of Ferguson’s career. He did bring out a book before so this one should be called Alex Ferguson, My Autobiography, Part 2. There are chapters specifically related to players from Rio, Beckham, Keane, Rooney, Ronaldo and Van Nistelrooy. It is a very open and frank book and he does not hold back in his assessment of players he has worked with and managers and players he has come up against. However like anything in life there are always two sides to a story so the things he has written about people and players have to be taken as his opinion. I know Roy Keane was upset at the comments made in the book but as much as I like Roy Keane, he too bought out a book years ago giving his own opinions about players and managers. On the whole it is a very fascinating and interesting read and gives you a great insight how he dealt with individual players and the team as a collective and his thoughts behind some of his decisions. The book is about interviews with legend that is Johan Cruyff. Fritz Barend and Henk van Dorp interviewed Johan Cruyff from 1974 to 1986 for Vnj Nederland and from 1987 to 1997 for Nieuve Revu. He also appeared on their popular radio and television shows. The book was published to mark his 50th birthday and of the five books written about him at the time, this is the only one Cruyff authorised and gave his 'blessing' to. 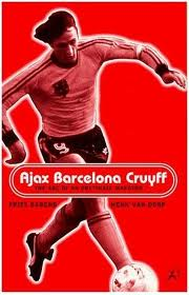 As the title suggests the book covers Cruyff's career at Ajax and Barcelona as players and manager. The interviews are fantastic and the questions are forthright and to the point, not questions just to appease Cruyff. For example in one interview he is asked, "Are you jealous of Real Madrid?" His answers are just as forthright and to the point, no hiding or pleasing someone or remaining on the fence. The book covers all the great players like Koeman, Van Vasten, Rijkaard, Romario, Gullit and others and Cruyff is very honest and open in his views on these players. Questions are asked of why he didn't take the Dutch National team job and deals with all his initial difficulties at Barca and also eventually at Ajax. For me the biggest thing is how astute and clever the man is tactically and how he thinks about the game. It is easy to talk about total football where we say players can interchange positions but his explanation on how and when and why is eye opening. 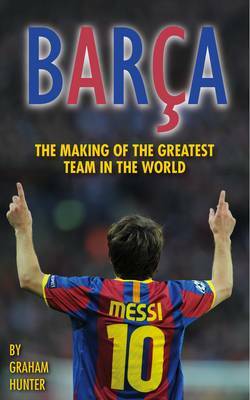 The book is 264 pages and I put it alongside 'Barca - The Making Of The Greatest Team In The World By Graham Hunter.' in terms of a fantastic read. The book consists of 374 pages with the last 18 pages containing bibliography and index. It contains 17 Chapters and an Epilogue. The book talks about football from the early 1920's through to the current era covering every relevant area of the globe. Its hard to imagine teams set up with formations such as 2-3-5, 2-2-6. It also shows other formations teams have adopted throughout the years and it can be seen that all this talk of the new holding defensive role or the player 'in the hole' is nothing new, just something the media make us think is a tactical masterpiece. The book covers a lot of the major games such as World Cup finals and European finals and also focuses on the coaches and managers throughout the world who have changed the way the game should be played and how it has evolved. It is very interesting to look at how all the different coaches and managers form different parts of the world thought about the game and developed it. For example in Europe the passing game was the way forward whereas in South America, when a European team first went there, they were encountered with players who used individual dribbling skills and focused on these in a game. There are some black and white and colour photos in the book which mainly highlight the coaches and managers who have played a prominent role in the game and also drawings throughout the book covering the major games as previously mentioned. This book is not an easy read to be honest unless you are totally immersed in the game of football as some readers may get bored about the early days of the game and how in depth it goes. 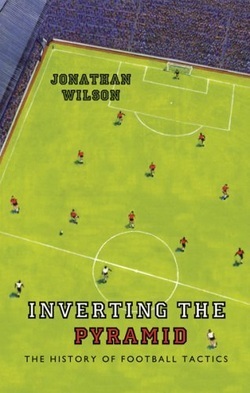 For those who coach and manage football teams, its a fascinating read, although you may have to go through it twice. Barca - The Making Of The Greatest Team In The World By Graham Hunter. 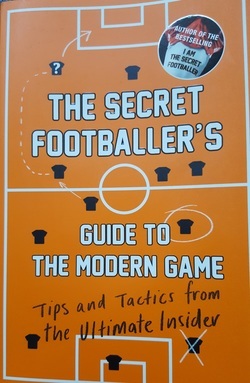 This book is written by Graham Hunter who often works on the La Liga programmes on Sky TV and he is also uefa.com's Barcelona correspondent and Spain's correspondent. There are more details about the author on the inside page. The book itself contains 478 pages with four colour pages of photographs in the middle. This book is not about the history of Barcelona Football Club, although you do get some insights into the past, but it is primarily about the current team and how it evolved and became arguably the greatest club football team in the world ever. There are 12 chapters which deal with the team as a whole and the individual players. The first chapter titled 'The Road to Wembley' talks about the win and lead up to the game against Manchester United at Wembley on May 28th 2011. Back to the book, the most fascinating chapter for me is Chapter 9, 'The Breeding Ground' which tells us all about the Barcelona philosophy, the development and psychology of the players. These players from a young age through to the first team have one consistent drill they practice called the 'Rondo' which is a possession drill that everyone knows where players form a circle with one or two defenders in the middle who try to get the ball. This is practiced thousand and thousands of times over but in an extract from the book it states 'In England that exercise is still seen as having a bit of a joke and a laugh'. Find out how Xavi could have joined Manchester United, how Pep Guardiola had to make the decision to remove Ronaldinho from the team, why Lionel Messi almost never signed for Barca, how Jose Mourinho almost got the job as Barca manager before Guardiola, the Cruyff influence and much much more. Is this book biased? Well everyone who knows me knows what I think of Barca but this is a book very much based on facts rather than opinions. Of course there are opinions in the book but the reader will make up his or her own mind on these. I would recommend this book to anyone who has even the remotest interest in football but to anyone playing the game currently, especially young players who are at an age where they can understand the game, this is a must read as it shows from speaking to the Barca players, there is more to becoming a top class footballer than just skill. These people are driven, determined but above all they are humble individually and collectively.